Raised in the African bush country by her zoologist parents, Cady (Lindsay Lohan) thinks she knows all about the "survival of the fittest." But the law of the jungle takes on a whole new meaning when the home-schooled 15-year-old enters public high school for the first time. Trying to find her place among the jocks, mathletes and other subcultures, Cady crosses paths with the meanest species of all - the Queen Bee, aka the cool and calculating Regina (Rachel McAdams), the leader of the school's most fashionable clique, The Plastics. When Cady falls for Regina'a ex-boyfriend, though, the Queen Bee is stung - and she schemes to ruin Cady's social future. Cady's own claws soon come out as she leaps into a hilarious "Girl World" war that has the whole school runnig for cover. Co-starring and written by Saturday Night Live's Tina Fey, Mean Girls is "Viciously Funny!" I have been meaning to rewatch this one for a while now. After watching "The Time Traveler's Wife" I noticed, that Rachel McAdams also had a big role in "Mean Girls" I felt now is the right time to watch it. This is an above average High School comedy. There are also a lot of familiar faces. Tina Fey of course. Also "Lily" from Veronica Mars is here playing a dumb blonde. And of course hot Lizzy Caplan, who I first knew from the really short-lived "The Pitts". 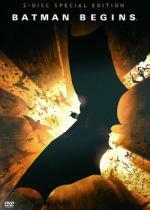 In 'BATMAN BEGINS', acclaimed director Christopher Nolan explores the origins of the legendary DARK KNIGHT. In the wake of his parents' murders, disillusioned heir BRUCE WAYNE (CHRISTIAN BALE) travels the world seeking the means to fight injustice and turn fear against those who prey on the fearful. With the help of his trusted butler ALFRED (MICHAEL CAINE), detective JIM GORDON (GARY OLDMAN) and his ally LUCIUS FOX (MORGAN FREEMAN), Wayne returns to GOTHAM CITY and unleashes his alter ego: BATMAN, a masked crusader who uses strength, intellect and an array of high-tech weaponry to fight the sinister forces that threaten the city. This movie moved the franchise in the right direction. I like the "realistic" approach this movie takes with Batman. Though I never warmed up to the villains in this movie. I don't like Scaregrow, and I really didn't like Liam Neeson's character. He is the cause that the movie slowed down too much in some places. Especially in the beginning. Also his masterplan to destroy Gotham City is ridiculous. High points in this movie are for me all scenes with Morgan Freeman's Fox or Gary Oldman's Gordon. I also really enjoyed Morgan Freeman as Fox. When Kym (Anne Hathaway) returns to the Buchman family home for the wedding of her sister Rachel (Rosemarie DeWitt), she brings a long history of personal crisis, family conflict and tragedy along with her. The wedding couple's abundant party of friends and relations have gathered for a joyful weekend of feasting, music and love, but Kym – with her biting one-liners and flair for bombshell drama – is a catalyst for long-simmering tensions in the family dynamic. Filled with the rich and eclectic characters that remain a hallmark of Jonathan Demme's films, RACHEL GETTING MARRIED paints a heartfelt, perceptive and sometimes hilarious family portrait. First of all, I don't like the camera work. It is shaky hand-held throughout. I am sick of those. I know they are going for a more "realistic" feel, but for me movie-makers going this route are just too cheap to use a steady-cam or a dolly setup. "Shaky-cam" just lets you never forget, that you are watching a movie. I can understand it when there is supposed to be a documentary crew there (like in "The Office") and the characters acknowledge there is someone standing there with a camera. Also the family drama was just not for me. It was like watching a reality show, where we have to watch some uninteresting people doing their stuff. Anne Hathaway was great though. But even she could not save this movie for me. Rachel Getting Married, is one of those films that I found boring and had I not been watching it with someone who was really into it... Id have turned it off. After the first ten minutes I almost turned it off, but as I paid good money for the Blu-ray and as Matthias has been raving about this movie, I wanted to give it a chance. ...and as Matthias has been raving about this movie, I wanted to give it a chance. From the best-selling author Roald Dahl and the unique vision of Danny DeVito comes Matilda, a modern day fairy tale that mixes hilarious humour with the magical message of love. 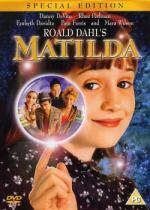 Matilda Special Edition is packed with brand new special features for lots of fun and entertainment! 'Mrs. Doubtfire's' Mara Wilson stars as Matilda, a super-smart little girl who's woefully misunderstood by her parents (Danny DeVito and Rhea Perlman), her brother, and an evil school principal. But with the help of a brave best friend and a wonderful teacher, Matilda discovers she doesn't have to get mad to get even. A very enjoyable movie. Mara Wilson (who I know from the remake of "Miracle on 34th Street") did a really good job in the title role. Also Danny DeVito and Rhea Perlman are great as the neglectful parents of Matilda. Embeth Davidtz as Miss Honey reminded me of Geena Davis in Stuart Little. Honestly, no word of a lie, I think Matilda is one of the very best children's films of all time, or at the very least of recent times. I don't think anyone has quite captured Roald Dahl's wonderful style as well as Danny Devito. The screwed up fairytale, genuinely scary villains, awful and outrageous things happening to cute children that cause nightmares for the nanny state political correctness mob, plus a healthy dose of sentimentality; I bloody love it! "I'm big, you're little; you're wrong, I'm right!" I especially appreciate it's message to love books and learning and not watch so much telly. I know there's irony in that statement, but sod it. I had a similar thought while watching the movie. Here I was sitting in front of my television and the movie was telling me to rather read a book. But then I thought that at least I am watching a good movie while the characters were watching some kind of stupid game show hosted by Jon Lovitz. Sorry. It should be clear by now from a number of similar cases that me raving about it probably means you won't like it. It should be clear by now from a number of similar cases that me raving about it probably means you won't like it. He's the heir to the Madison Hotel millions but in order to win his father's respect, and his Fortune 500 company, grown-up, goof-off Billy must repeat all 12 grades of school - in just 24 weeks! Comedy Superstar Adam Sandler stars with beautiful Bridgette Wilson in this laugh-a-minute hit where the subject is always fun! Featuring songs by Electric Light Orchestra, The Jackson 5, The Cars, Culture Club, The Ramones and Styx. I thought I'd check out this movie again if it really is as bad as Pete recently wrote, or closer to what I remember it being. For me it is still about the same as when I saw it years ago. It had a few good parts and bad parts. I have never enjoyed the juvenile beginning, and I never enjoyed the stupid end. But I enjoy the middle part of the movie. I always thought it a fun idea to have Billy repeat all twelve school years, with two weeks for each grade. He really did fit into elementary school. And the high school part started interested. Sadly the movie then chose to go into another direction which prematurely stopped the high school part. It would have been much more interesting to follow him through high school and him trying to fit in there. As for the love interest: She is really hot, but her falling in love with him just did happen much too fast. One minute she couldn't stand him. The next time she is seducing him. The school trip scene is what supposedly changed her view of him. But it would have been better if it would have only been a starting point from where she gradually gets to know him better, instead of her making a move on him the very next day. Overall I am glad it wasn't as bad as I had feared I would think of the movie this time around.